Update: MaryTylerGore and StudioL have posted the information and sign up sheet for the gift exchange! Check it out! It&apos;s Time for a Holiday Gift Swap! So. I've been noticed all these posts about gift suggestions and ideas, and it got me to thinking, "I don't have very many people to give gifts to." I don't have any nearby gift exchangy friends, so it's really just me and my family. And since I'm an only child, I only have to buy for my parents, and they don't want much anyway (and one gift for the extended family gift exchange). Then I remembered that there was a GT gift exchange a while back. Is anyone who participated in it still around? How did it work out? Do you think it would work now, what with the influx of new people? Would anyone be willing to help me organize one, if it does turn out to be a feasible idea? 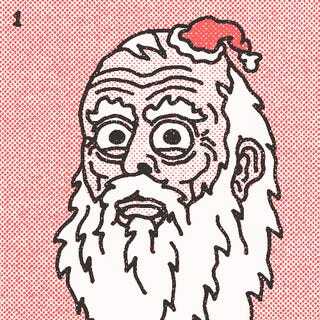 And here's a really creepy Santa. ETA: I'm going to fall asleep now, but I'll be up bright and sort-of-early with responses and a tentative plan! Suggestions are welcome! ETAA: Here's a link to the process that MaryTylerGore and StudioL set up last time. They did an awesome job organizing and were already thinking of doing another one, so keep your eyes peeled! MaryTylerGore said she was thinking of putting up a post early next week, so I jumped the gun a little bit. I'll keep adding links here, or search for 'Gift Swap' or 'Gift Exchange'. Groupthink Gift Swap - Sign up info included!